tummple! can be viewed as a reverse Jenga. Starting from the flat rectangular base pieces, players try to build a wooden structure as high as they can. The two starting pieces must be directly adjacent and touching along their flat edges. On a turn, the player rolls the special d12, and then takes the action shows on the die. The tummple pieces are long wooden rectangles, and the die may ask you to place it on the wide side, the narrow side or even on its end! If the tummple! side comes up, you can choose to play your wooden piece on any side. There are also two tump sides – there are the wooden half spheres which come in two varieties: white and yellow. If you roll one of these sides, you take the corresponding tump and place it onto the structure. When you place any piece or tump onto the structure, you are allowed to choose where it goes. You may not move any previously placed pieces. White tumps block a certain area on a wood block – as nothing can be moved, you simply cannot place your piece where the white tump is. 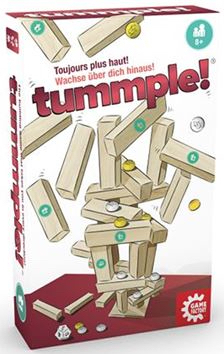 The yellow tump is a more problematic roadblock though – the entire wooden piece that has the yellow tump cannot be played on! 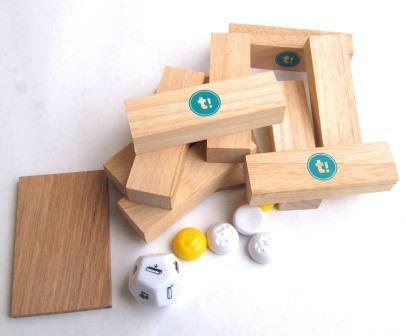 Be careful when you place your piece – if you cause anything to fall down, you must collect all of the fallen pieces whether they be wood blocks or tumps – and keep them in front of you for the rest of the game. They will not be used any further in the game, but they will count as negative points against you. Your turn is over as soon as you have successfully placed your piece – the next player rolls the die and then places his piece. The game continues until the entire set of wooden blocks is placed – there are 54 of them in the box – at that point, the player with the fewest pieces in front of him wins. If there is a tie, all tied players move into the sudden death round. The die is rolled as usual, and the active players simply take a piece from amongst those which had fallen earlier. 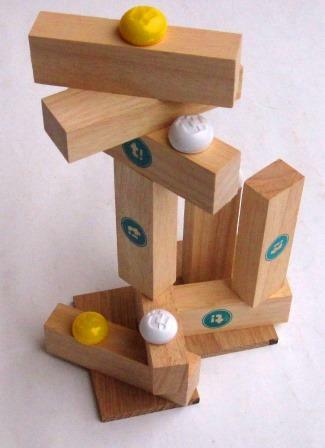 Any player which causes a piece to fall from the structure is eliminated from the game. The last player left standing is the winner. 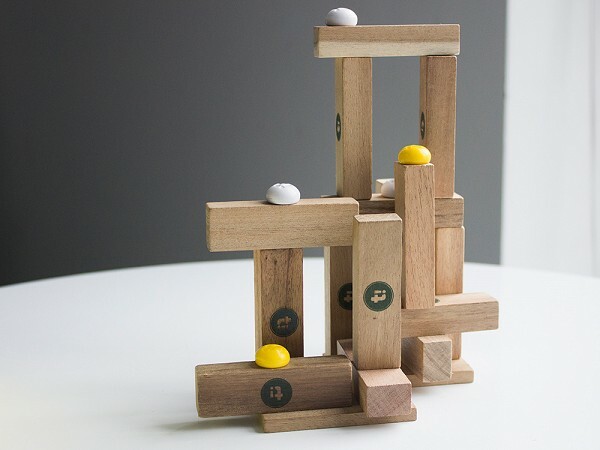 The rules do state that if the table is able to use the entire box of blocks without anything falling off – then all players win together! tummple! is simple dexterity game. I would highly recommend playing on as stable and as level a surface as you can find. We first played on a folding table, and it didn’t go well. As the structure grew ever taller, even a small jostle of the table was enough to get the whole thing swaying. Even putting your hands on the table became dangerous. After that first game, we’ve moved all later games to the ping pong table which is on top of my pool table. Completely level and completely stable. A much better arrangement. As the rules would suggest, there’s not really a lot of strategy in the rolling – you simply see what the die tells you to do and then make the best of it. Once you know what you’re placing, then there can be a lot of interesting choices. If you’re placing a block, depending on which end you’re using, you can choose to play it safe and just stay in the round… or if you’re daring, you can try to place it in such a way to make it difficult for the next player. After all, your goal is to be the person with the fewest knocked over pieces at the end of the game, so if you can make your opponent knock stuff over – then it’s good for you. If you’re lucky enough to get a tump, you can definitely wreak havoc on the structure. By blocking the easier places to play, you’ll definitely give your opponents a harder choice on their turn! This is a nice family game which we enjoyed over the Thanksgiving break. We had a nice session with a building session of tummple! followed by a destructive game of Jenga and then moved back into building things with JunkArt. I don’t normally have a lot of playing opportunities for this sort of party game in my usual gaming group, but it was a great fit with the younger family members at the holidays.